Jio Celebration pack offer- jio user Get 8GB Data Free For 4 Days use.Jio is providing Add on Jio Celebrations Pack Free 2 GB Data Par Days.offer valid For All Jio Prime Subscriber . Active This Offer you Need to claim It From” MY JIO App”. 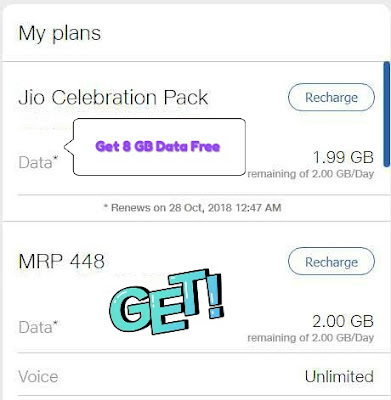 How to Get 8GB Data 2 GB Data Per Day 4 Days.From Jio Celebration Pack. 2.install And Open Jio App . 3.Now Go to My Jio App –Top Left Menu–Get Option. My Plan . Celebration Pack. 1.This Offer Data is provide at Free Cost. 2.You can use this free data after you have finished your daily data.